Great news from Animals Today! Animals Today, a signature program of AIA, is proud to announce its new production and distribution partnership with Radio America. Radio America is one of the Country’s leading producers and distributors of radio programming, serving over 500 stations, the American Forces Radio Network and Sirius/XM Satellite Radio. Radio America’s programs include The Chad Benson Show, The Dana Show, Doug Stephan’s Good Day, and many more popular shows. Animals Today airs each Saturday at 8am EST, and prior shows can be found on iTunes and the Animals Today Radio website. To listen live, visit Radio America. The signature program of the nonprofit, Advancing the Interests of Animals (AIA), is its weekly, one-hour nationally syndicated radio show, Animals Today. Currently in its eighth continuous year, this show provides a worldwide platform where individuals and organizations concerned about the welfare of animals can present their viewpoints and promote their causes. It is a communication hub where listeners learn about a wide variety of animal welfare issues as well as the actions they can take to help animals locally and around the globe. 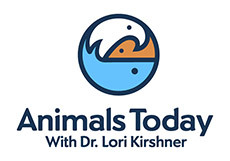 Hosted by Dr. Lori Kirshner and co-host/producer Dr. Peter Spiegel, Animals Today airs in multiple markets with a potential audience of millions of listeners. Listeners worldwide may enjoy live shows via internet streaming, and past shows are archived on the Animals Today website and YouTube for free access anytime. “Lori, thank you for all the work you and Peter do to produce Animals Today. Your show is more than just entertainment, it is a unique and valuable source of information on animal issues worldwide, with vital information as to what caring people may do to improve the lives of animals. I encourage anyone who cares about our nonhuman friends to listen to you.” Steve Hindi, President, Showing Animals Respect and Kindness.